Who leads the Amish church? Amish society is comprised of some 1800 church districts in 28 states and Canda. 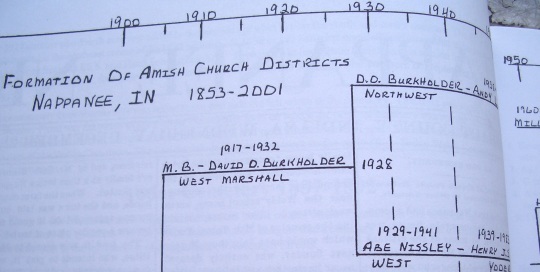 Amish church leadership is primarily congregational, lacking the extensive hierarchical structure found in many other religious bodies. The Amish congregation is led by a bishop, two to three ministers, and a deacon. Each member of the ministry plays an important role in the spiritual life of the Amish church. The Amish ministry is untrained and unpaid. Most church members feel that being chosen for the Amish ministry is a burden and a blessing. Few Amish men seek the role; one Amish minister when passed over for the choice of bishop expressed relief at having “dodged a bullet”. The bishop is the spiritual leader of the church district. A bishop typically oversees one district, but in some settlements, such as Lancaster County, he will be responsible for two. When a district divides in two, a bishop will typically “take care of” both districts until a new bishop can be ordained, which may take a year or two. Contrary to belief, the bishop does not arbitrarily assign rules for his district. His role is one of deciding which issues should be put to vote—for example, to decide if a new technology, currently under trial, should be accepted into the district’s Ordnung. The bishop is charged with the spiritual welfare of his district. For this reason bishops often seek to err on the side of tradition, slowing change and restricting technological adoption. At the same time, numerous bishops acknowledge that economic and other pressures on the church can be eased by allowing certain technologies. Amish bishops may choose to support milking technologies that permit more of their congregation to remain in farming. The good that comes from keeping congregants employed on farms rather than in non-Amish factories may be seen as greater than the potential ill that may result from adopting a worldly technology. Due to the varying Ordnung among districts, resulting from a variety of internal and external factors which differ among districts, there can be a variety of practices seen in any given settlement, even among Amish of the same affiliation. The bishop does some preaching at church services. He also is in charge of meting out discipline and forgiveness on behalf of the church community, in cases where members stray and violate the Ordnung. The bishop ordains new members of the ministry, baptizes Amish youth into the church, and is responsible for performing marriage ceremonies. Ministers, which Amish often refer to as “preachers”, are responsible for delivering sermons in church on Sunday. Typically, each district has two or three ordained ministers. Ministers are highly respected in the church. One often hears this respect reflected in the tones other church members use when speaking about them. At the same time, Amish are human, and some members of the ministry may wield influence in heavy-handed ways, generating resentment or criticism. Regardless, ministers are highly important figures in the Amish church as they are responsible for delivering the word of God on Sundays. Ministers typically spend a good chunk of Saturday preparing for the Sunday service. This is done by studying and reading the Bible in English and German as well as other study aids such as concordances. It is not decided who will do the actual preaching until the ministers meet during the singing which opens the Amish church service, so each minister must be prepared to speak for up to an hour on Sundays. Sometimes ministers visit from other districts in a community or even from another settlement entirely. In such cases the visiting preacher often delivers a sermon. Amish preachers speak without notes and without rehearsal—relying on the Holy Spirit to inspire their words. Preachers have varying styles, as evidenced by the tone of voice they use, repetition, and examples they share to make points. To begin, a preacher simply stands up and starts preaching, typically after first humbly expressing the feeling that he is unworthy to do so. As a testament to the importance Amish place on community and collective effort, at the end of preaching, a preacher will ask the other members of the ministry if what he said was correct, and for any corrections to be made. At this time others offer testimony by confirming, adding to, or correcting what was discussed in the sermon. Members of the ministry are typically seen as role models. Often when new changes have been adopted in Amish churches (and in other Plain Anabaptist churches such as those of Old Order Mennonites), members of the ministry have been the last to adopt a new innovation. In this way they may serve as the vanguard of tradition. The deacon fulfills a number of functions. Amish have called the job of deacon the most thankless job in the church. The deacon is responsible for collecting and organizing alms for members who have high medical bills or other financial challenges. The deacon is also the one who is sent to tell wayward members to “put away” forbidden technology, or to discuss other issues with the Ordnung, the Amish set of rules guiding daily living. The deacon typically does not preach in church, though he will read Scripture and recite the High German prayer at each service. In some cases, a deacon can be ordained a minister as well. The deacon also handles wedding announcements. A prospective young couple will share their intention with the deacon. The deacon may act as an interlocutor in getting the approval of the young couple’s parents. The couple will then be “published” to the church. In other words, their intention to marry will be announced, and a wedding will typically take place within a few weeks. When being baptized, all Amish men take a vow that they will accept the responsibility of ministry if so chosen. When a new minister needs to be chosen (typically when a church district divides, or if a minister moves away or dies), all male members are eligible to be nominated. Female Amish are not eligible, however they have the right to nominate a male member. Members take turns nominating in secret, and each member which surpasses a certain threshhold of votes (usually two or three) becomes a candidate. In the next round of selection, candidates select from an assortment of songbooks, one of which has had a slip of paper containing a Scripture verse. The bishop then inspects the book to find out which man “the lot” has fallen on. The chosen one is ordained on the spot, and begins his new life as a minister in the Amish church. 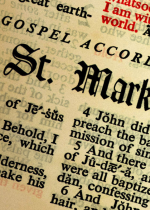 The basis for drawing lots is found in Acts 1:23-26, in which Matthias was selected by lot to replace Judas among the apostles. Selection of a minister is often an emotional event, as church members realize the weight of responsibility that has fallen on the man’s shoulders. Raber’s Almanac, also known in German as Calender, is a booklet printed annually by an Ohio Amish printer, and which contains a comprehensive listing of the ministry, complete with address and dates of ordination, for all of the Amish church districts in North America. Raber’s Almanac also includes a listing of Old Colony Mennonite ministers. Amish ministers are charged to a degree with the spiritual welfare of their district’s members. Amish ministers show concern for the pace of change and the spiritual state of their churches. Ministers may meet together at Bishop’s and Minister’s meetings to discuss technological change and other issues. Amish are highly congregational, yet Amish in communities such as Lancaster County and Elkhart and Lagrange Counties in Indiana attempt to maintain unity across affiliations, even though technology and style of dress may vary. In guiding the congregation, the Amish ministry is charged with additional spiritual and emotional burdens, all without the benefits of training and additional pay. For this reason members of the ministry are highly respected. Ministers themselves recognize the burdens, but also the blessings that being a member of the ministry entails. 6 responses to Who leads the Amish church? Great article! It was nice to have all that information in one place to read. I have wondered what the differences where exactly, and you answered that question. Thanks! Although enlightening, I am interested to know more about their views regarding the New and Old Books of the Bible. Is the translation a matter of conjecture and symbolism, or are the words taken at face value? Who do the Bishops report to? There is a Bishop in the area of Coudersport, PA that is not dealing with other they way that he should. Can you please tell me who he would report to? When God gave man dominion over the animals it was to care for, and protect them. Some Amish lust for money and run puppy mills where dogs may endure incredible neglect and cruelty. Not one sparrow falls that goes unnoticed by God, and good Christians know it. Those who participate in the puppy mill industry are fooling themselves and others when they claim they are Christian. They are anything but, and will be punished when the time comes. Those who know this practice is taking place but fail to do anything about it are just as guilty in God’s eyes. Everyone one of us will be called upon to answer the question “What have you done to care for that I have entrusted to you?” I hope God has more mercy on the puppy mill operators, and those who know about this evil but remain silent, than these evil people show for creatures that were created by and belong to God alone. Amen Roland, thank you for caring and praying for the abused and neglected. I searched the topic “who is in charge of the Amish church?” specifically to beg them to have mercy on and respect God’s four legged critters. The Amish proclaim to follow The Bible so faithfully . . . meaning there is but one Creator, yet they treat God’s animals, especially horses and puppy mill dogs horrifically!! How God must weep seeing the way his supposed devout Amish followers treat “His” animals. Puppy mill dogs sustain the Amish families yet they are used and abused while they are alive and thrown away like trash 🙁 The horses are worked to death again sustaining the Amish families yet many are treated horrific. It is much more sin to follow God, read his book, and defy it than it is to not know. Everything you read about the Amish proclaims they follow The Bible completely . . . how then can they treat God’s animals as they do? Sinful in Our Father’s eyes. For the many Amish who do care well for God’s creatures I am thankful. Having been in dog rescue for decades the abusers in the Amish community haunt the rescue world. D Gordon, I am thankful that you recognize there ARE Amish people who do care well for their animals! To be fair, we cannot class all of any group is a certain way… For example I do know of non-Amish people who are very cruel in how their animals are treated, but I don’t assume that ALL are. It always saddens me to see an animal neglected or cruelly used by ANYONE. Leave a reply to Who leads the Amish church?